- D'ADDARIO ACCESSORIES - For over 20 years, D'Addario Accessories (formerly Planet Waves) has been leading the industry in innovative and problem-solving products that serve musicians worldwide. D'Addario Accessories are proudly made in a state-of-the-art manufacturing facility to the most stringent quality controls in the industry. - CUSTOMIZED TENSION - Varigrip allows you to adjust and customize the tension for each finger so you can strengthen individual fingers and prevent favoring certain fingers. 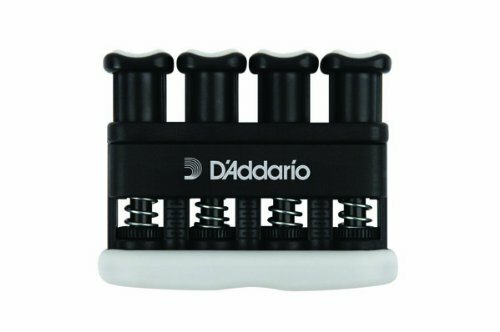 - BUILD STRENGTH AND DEXTERITY - With the Varigrip by D'Addario, you can develop and maintain strength and dexterity in your fingers, hands and forearms. The ergonomic design and over molded finger pads and grip help make your conditioning workouts comfortable. - SIMULATED STRINGS- By removing the reversible molded grip you can uncover a simulated string that helps develop and maintain finger calluses for string musicians. - ON-THE-GO CONDITIONING - Whether you are warming up pre-show or conditioning when you're away from your instrument, the Varigrip is the ultimate portable workout. At the office, at home or on the train, you can keep up your finger, hand and forearm strength and coordination.